Live Dragon Tiger is the latest Baccarat variant from Evolution Gaming. 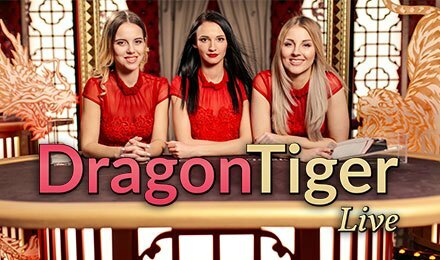 This Baccarat game is played in a personalised studio, where you will find dragons and tigers making up for the rest of the decorations. The super-fast game of Baccarat is not only appealing, but allows you to finish a game round within 25 seconds. Begin your gameplay by betting on Dragon, Tiger, Tie or Suited Tie. A single card is dealt to both Dragon and Tiger positions, where the highest card value wins. Winning on either Dragon or Tiger bets pay even money. Tie Bets are voluntary side bets on either of the two cards being equal in its value, irrespective of the suit. You get half of your main bet back if you’ve placed a tie bet and it happens to be tie bet! Tie Wins award 11:11. The Suited Tie Bets are optional bets on the Dragon and Tiger cards that are equal in both rank and suit. In a Suited Tie Bet, half of the players main bet is returned. They also win a payout of 50:1. Vegas Spins Casino gives you the chance to play Asia’s most popular Baccarat version, Live Dragon Tiger. Enjoy the game now from the comfort of your house on your preferred devices.